Richard, Thanks again for your interest, man that was a long time ago, I have trouble remembering yesterday! Like I said, we were on first or second.People were still coming in,finding their little patches of turf, laying out blankets and ingesting whatever their particular preference of poison. M.D.A. was in great supply that summer in Toronto. Ah, the love drug.Playing to a stadium slowly filling up wasn't exactly inspiring, but sharing the stage with virtually every big act at the time was/is something I'll carry to the grave. Anecdotes: Getting drunk backstage with who turned out to be James Pankow, trombonist/arranger for CHICAGO; coming to behind the stage to the rumble of 100 Vagabond Harleys escorting the Doors' limo to the dressing rooms. Well, thats about all, Richard. Oh yeah, Whiskey's spelled with an 'e' in it and my names John Witmer using Larry Smiths' address. 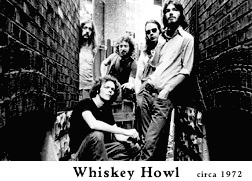 Note: This is the only photo I could find of Whiskey Howl and it shows Michael Pickett crouched in the foreground. Michael is still rockin' better than ever in the Toronto area and nationally. He and his wife Louise, graciously helped me contact John Witmer.